with the NSSB, and has had a long and varied career as both a music educator and performer. College, Duquesne University and Carnegie Mellon University, teaching music education and music history. Mr. Iezzi also spent three years as a member of the education department of the Pittsburgh Opera, serving as coordinator of the Pittsburgh Opera Academy for Educators. As a performer, Mr.
Iezzi has played with the Wheeling and Butler Symphonies, Pittsburgh Opera, Pittsburgh Ballet, Civic Light Opera, River City Brass Band, the Edgewood Symphonyand spent twenty-six years with the Westmoreland Symphony as a French horn player and Associate Conductor. 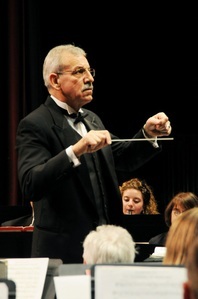 He was Music Director/Conductor of the Pittsburgh All-City Honors Orchestra from 1988 to 1999. At the time of his retirement, Mr. Iezzi was also a teacher of French horn at the Pittsburgh Centers for the Musically Talented and member of the Edgewood Symphony horn section.